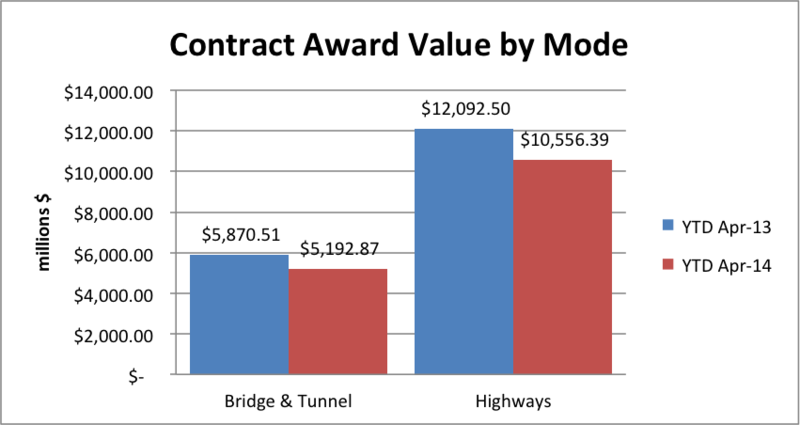 There continues to be evidence of a slowdown within state and local highway and bridge construction programs as uncertainty about the federal Highway Trust Fund worsens, according to ARTBA analysis of April contract award data from McGraw Hill. State and local governments awarded about $19 billion for all transportation contracts in the first four months of 2014, compared to $21.2 billion in the first four months of 2013, when adjusted for inflation and material costs. Absent new revenues, the federal aid program would not be able to support any new projects in fiscal year 2015, which starts October 1. At least fifteen states have publicly said they will need to consider canceling or delaying projects during the 2014 construction season if Congress does not resolve the situation soon. The slowdown is widespread, with 27 states awarding fewer highway and bridge contracts in April 2014 than they did a year ago. Awards were up in 22 states and Washington, D.C. and programs were fairly flat in two states, either up or down within five percent. Contract awards are a leading indicator of future work in the industry as projects get underway. Detailed data by state and mode is available as part of ARTBA’s market subscription reports. For more information contact ARTBA’s Lital Shair.